On 21st April 2012 a group of Belgium parents whose children had been injured following vaccinations, placed a row of tiny white coffins outside the Ministry of Health. They demonstrated their anger by attaching two vaccine syringes in the sign of a crucifix onto each coffin, symbolizing the death of a child snatched cruelly by vaccinations. One coffin inscribed with the words 'RIP Notre Fille Stacy' meaning 'Rest in Peace Our Daughter Stacy' stood out from all the rest. Underneath carefully placed was a photo of a baby girl dressed in white. What message could be stronger and more poignant than this, to demonstrate the anger felt by grieving parents on the first day of the 'World Immunization Week' arranged by the WHO? World Immunization Week is an annual event organized by the WHO to unite countries worldwide, for a week of vaccination campaigns, public education and information sharing with the idea of promoting vaccination awareness. I doubt very much if this was the kind of 'vaccination campaigning' or 'vaccination awareness' that the WHO had in mind, as these parents gave their own interpretation of vaccination awareness by distributing leaflets on the dangers of vaccination demanding vaccination freedom for their country. Could this be the reason that parents in Belgium are being bullied into having their children vaccinated just to enable them to get daycare facilities? She and other parents feel that expelling unvaccinated children from nurseries is a ploy by the governments to bring mandatory vaccination through the back door. They want to be able to be free to choose whether to vaccinate their children or not. For European Parliament/EuroparlTV (6) to even acknowledge adverse reactions to vaccination, is a massive achievement and will ultimately aid the many parents fighting to expose the dangers of vaccinations. The documentary (7) is now available. "Every time a child is born parents receive a precise recommendation before leaving the hospital, 'don't forget to vaccinate your baby'. The most well known cocktail is the so called MMR against Measles, Mumps and Rubella but not the only jab we receive in our life. This recommendation is not only given in Belgium but worldwide. Although EuroParl TV does their best to show both sides of the story, their documentary is as usual weighted heavily on the side of vaccination. Before interviewing Dr Charles Tannock, Mr. Delfosse began with a short film presented by Arnaud Demolder. The film told the story of unvaccinated 15 year old girl Natasia who had recently been in a coma after she had contracted measles. However, instead of researching the subject Demolder and his team explained that Measles can have serious consequences such as neurological damage, ear infections and pneumonia adding that if 95% of the population were vaccinated, the other 5% would be protected. He omitted to mention the fact that vaccinated children can still catch measles and that many children can die after routine vaccinations. "In a democratic country, it's the least we have, the freedom to act to heal and care for children. We find two protesters at home. In 2011 Rapheal and Beatrice lost their daughter Stacy senior two and a half months. Here too, the same question arises, who is to blame? Shortly after a 1st vaccination, Stacy died of blood poisoning. For her parents, Stacy died of her vaccines. She has received a cocktail of vaccines, quite a mixture, the bacterium Haemophilus influenzae can cause the syndrome Waterhouse. The case is in the hands of justice. After the death of Stacy her parents decided not to vaccinate her twin sister. Very impressive figures except that according to Barbara Loe Fisher from the NVIC (National Vaccination Information Centre) since 1990, between 12,000 and 14,000 reports of hospitalizations, injuries and deaths following vaccination are made to the federal Vaccine Adverse Event Reporting System, or VAERS, annually. She adds however, that 'it is estimated that only between 1 and 10 percent of all doctors make reports to VAERS. Therefore, the number of vaccine-related health problems occurring in the United States every year may be more than 1 million'. (9) If this is true then if your child is vaccinated there is 50/50 chance that they will suffer a vaccine injury. Not great odds are they? The documentary then interviews Mr. and Mrs. Sirjacobs. Their interview is very moving and shows images of an empty cot and photos of Stacy before her death with her twin sister Lesley. "You are a MEP and also a psychiatrist; you are a member of the conservatives and reformist here at the European Parliament." In the case of vaccination, in my professional view and in my political view as a politician the risks are very, very tiny and they are vastly outweighed by the rewards in terms of the benefits to the individual and to society as a whole. So I am fully behind public health measures to ensure that the vast majority of the populations have all their normal vaccinations which have been very well studied over very many years. "Of course it should never be compulsory to have your children vaccinated it is very desirable and there should be public health campaigns if necessary to educate the populations as to the advantages of why we have these vaccinations. They are expensive, it costs the tax payer money they're not something the state can dispense with for free. It costs a lot of money and there is a good reason why the government spends money on vaccination and why the international union needs to spend more money nationally on making these vaccinations more available in the developing world. I am part of a campaign called GAVI to export vaccinations to the developing world." I advise everyone to see this video. This G.P. needs to seen to be believed. It appeared blatantly obvious throughout the interview that Dr Tannock had been trained to speak like a parrot and that he had little compassion for parents facing a life without their child or for parents caring for a child severely brain damaged by a vaccination. His opening line said it all 'I have a professional expertise because I am a medical doctor. I am the father of small children and I have obviously studied the issue carefully over the years'. In other words because I am a doctor I know everything and therefore you have to trust me. Throughout the film he spoke a mantra of well rehearsed lines getting more and more heated as time went on. It is a real shame that this doctor could not see the photographs being displayed behind him throughout the interview. 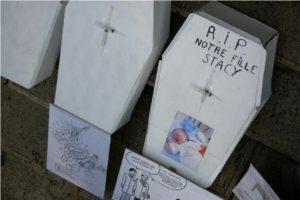 While he was speaking, EuroparlTV were displaying photos of fragile Stacy fighting for her life and the protest, with parents handing out leaflets beside the little white coffins demanding vaccination freedom for their country. I felt that their choice of photos during the interview made a complete mockery of his words. Regardless as to the outcome, this whole event is a huge step towards raising awareness of the dangers of vaccination, not only for Belgium but for the world. Mr. Sirjacobs is so determined for the truth about vaccinations to be known that he and his wife are planning another protest in the near future, this time to march throughout the towns of Belgium. Again these brave parents will be demonstrating for the right to vaccination freedom throughout the world in the hope that one day all parents will have the right to choose whether they vaccinate their children or not. I would like to thank Mr. and Mrs. Sirjacobs for not only organizing this event but offering me the chance to write on such a moving show of emotion and for supplying all the photos used.